Introducing a new and unique sound match memory game. It's like nothing you've ever seen before! You'll love it! 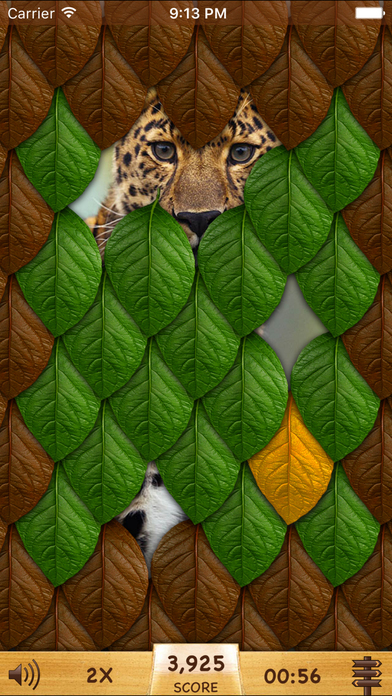 - Pictures of wild and exotic animals are hidden behind a mesh of leaves. - Tap the leaves to match animal sounds and reveal the pictures behind the leaves. - Once you reveal a picture you can preview it full-screen, save it to your Photo Album and post your score to Facebook or Twitter. A gallery of pictures is available from the menu so you can view and browse through the solved pictures anytime. If you have to keep the noise down you can play with Silent Mode ON. In Silent Mode you match numbers instead of sounds, though playing with sounds on is way more fun! The game keeps score and will let you know when you beat your best score. High Scores, Best Times and Achievements are registered in Game Center. The game saves your progress so If a call comes in you can answer it knowing that you can resume from where you left off. The timer is also paused. For every 3 matches you complete you win a Free Pass. Use them in the Gallery to reveal a picture for free. Enjoy the game and please leave a review and let us know how you like the game. Reviews help with the continuous support of the game.